There may be no movie from 2017 more divisive than this summer's Alien: Covenant, but that doesn't mean there still won't be an Alien: Covenant 2. Ridley Scott delivered on the promise of giving us a whole lot more Alien action than we got in Prometheus, but Covenant also wasn't what many fans were hoping for. It's a weird movie and one that didn't do what Fox was hoping it would at the box office. Still, despite that, Scott is still planning on making at least one more Alien prequel that will take us up to the events of the original Alien movie. Now, the prolific director has revealed some plot details for the Alien: Covenant sequel. Ridley Scott was recently a guest on the Empire podcast, since he serves as a producer on Blade Runner 2049. During the course of the conversation, the subject of his next proposed Alien prequel came up and he revealed a little bit about it, without giving away too much. Likely to the chagrin of many fans, he says the next movie will focus more on androids and A.I, as opposed to Xenomorphs. Here's what he had to say about the Alien: Covenant sequel. "I think the evolution of the Alien himself is nearly over, but what I was trying to do was transcend and move to another story, which would be taken over by A.I.'s. The world that the AI might create as a leader if he finds himself on a new planet. We have actually quite a big layout for the next one." 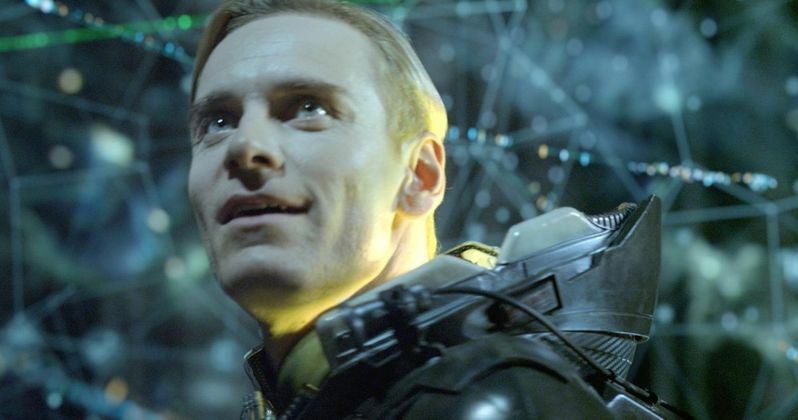 There's quite a bit to unpack with the comment, but first and foremost, it sounds like the next Alien movie is going to focus a whole lot on Michael Fassbender's David, as opposed to the evolution of the alien species. Granted, Alien: Covenant did give us a fully formed Xenomorph, so there really isn't a need to evolve the creature any further. So in some ways, what Ridley Scott is saying makes total sense. Still, the idea of a movie focusing a lot more on androids and A.I. probably runs counter to what fans want from the franchise at this point. Given how Alien: Covenant left off, with David taking over the Covenant craft with the entire crew and passenger load aboard headed for a new planet to continue his experiments, there is actually a lot of room to play with what Ridley Scott proposes here. Whether or not that is going to be satisfying to anyone who even wants to see another Alien movie is another question entirely. It was reported over the summer that Fox was rethinking their strategy with the Alien franchise following the disappointment of Alien: Covenant. Despite the massive hype heading into it, the movie only made $239.8 million worldwide. That's a little more than half of what Prometheus made. So there's a chance that this proposed prequel/sequel may not even happen at all. If it does, the script is reportedly complete and Scott hopes to get cameras rolling next year. We'll have to see if that comes to pass. You can check out the entire podcast with Ridley Scott over at Empire.